Beat and mix all ingredients thoroughly and if your using the Buckwheat version- you will just have to make sure you mix it good before pouring every pancake because it likes to fall to the bottom. Pour pancake batter into regular skillet to full size of skillet. 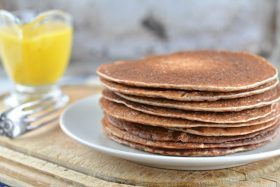 These are thin pancakes you then put butter on and fruit or powdered sugar or maple syrup etc. Or however you want. These are actually a pretty balanced food. Not as many carbs as you would think plus it’s all 100% whole grain carbs- meaning very good carbs. Add up the protein from all the grains (once u see the labels) combined with the 3 eggs and the cup & 1/2 of milk. And you will see how much protein and the highest quality protein from all the sources. And most people use somewhere between a half stick to a full stick of butter (like me!) for the full batch. Obviously, Organic buckwheat and the highest quality of everything best. Don’t worry if you can’t find Organic Oat Flour because it’s a very hardy grain that very little if any pesticides are used on. And supposedly it will NOT go GMO because it’s to complex of a grain from them to do that too. And just buy the regular Bob’s Mill Whole Grain Oat Flour NOT the ‘Gluten Free’ Oat Flour unless you want to pay double. Only a truly full blown celiac may want to choose that. Oats are naturally ‘gluten free’. The only difference between the flour- is the regular version “may be ground that the same machine may have ground some whole wheat or other gluten containing grains”. So, there could be a very tiny amount that shouldn’t even affect the worst celiac especially if there taking a good probiotic with ‘Bifidobacterium lactis’ which is the one probiotic strain that has proven to be able to break down gluten- imagine that! And this was the awesome probiotic for the price. These are cultered right on the vegetable concentrates that are in it along with a nice size dose of Ionic trace minerals That are super Important. ​Spread the Recipe and Info freely as u like. This entry was posted in Article-Commentary and tagged Food, Health by BLKnight. Bookmark the permalink. Next → Next post: F2F Radio 03/25/18 – Omnibus Work Around?